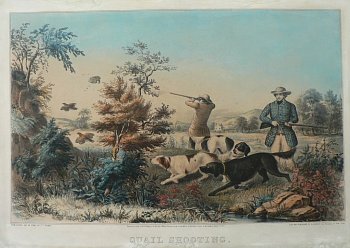 A wonderful medium folio shooting image based upon the painting by Frances Flora Bond (Fanny) Palmer, the artist of some of Currier and Currier and Ives most significant lithographs. This one depicts two hunters in an autumn landscape accompanying by three pointing setter dogs. One hunter takes aim as three quail flush from the brush below. 15 ½ x 22 inches, sheet. Professionally conserved and backed. As shown in photograph, some issues with the top and bottom margins. Good condition overall.